It’s been a long couple of months for iPad owning YouTube users who’ve missed the app in iOS 6. But on Tuesday Google(s GOOG) announced a revamped native YouTube iPad app, as well as some updates to the app for the iPhone 5. Apple dropped the YouTube app from its default inclusion in iOS 6, and since September, Google had only issued a replacement native app for the iPhone and iPod touch. But Google is finally giving the iPad some love too. The app updates include improvements and enhancements for the larger screen iPad as well as Apple’s latest iPhone. 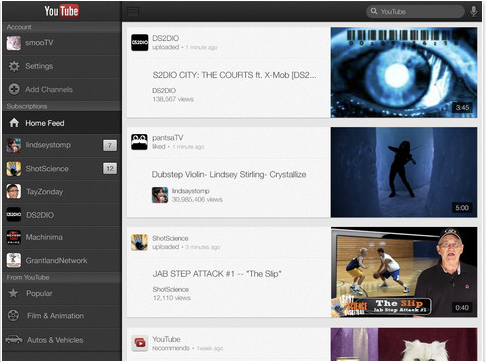 YouTube videos can now be streamed from the app with AirPlay to an Apple TV. Videos can be more easily added or removed from playlists, and it incorporates VoiceOver, a voice interface feature of iOS for blind or low-vision users. The app looks different than the previous default iPad YouTube app thanks to some visual tweaks by Google and the addition of a sidebar menu with lots of options. Another thing longtime users will notice in the new app: ads. Now that YouTube is making its own app, it has more options for how to make money off if its mobile video content. well! That’s good news! I think that Google must make competitive fairly. Google just want to promote for their smart phone. Therefore, Google want to make some problem for Apple product…that’s not good at all!